What if Jesus really is who He says He is? What if the King of the universe is speaking directly to me through the words of His book? What if what He says is more true than my circumstances? Than what my eyes see and my ears hear? And if His Word is true, how do I respond? Something in me should change, but what? How? Because if this story is true, then the King of all kings, the infinite God who spoke the Milky Way and me into existence — because He loves me deeply — stepped off His throne and embarked on a rescue mission to save and deliver a self-centered slave like me. What kind of king does that? What if the death and resurrection of Jesus the Christ is the singular most important event in the history of mankind, and what if one drop of His blood is the most powerful thing in this universe or any other? What if dead and crucified Jesus came back to life by the power of the Holy Spirit and He is alive today? Right now. What if, having conquered the enemy, He empowers us to do what He did? Anointing us with defense against evil. Against addiction. Against sickness. Against generational sin and curse. Against the hardness of our own hearts. What if His singular desire is for us to know the love with which the Father loved Him before the foundation of the world? Our enemy, using every tactic and weapon at his disposal, has attacked this gospel. These words. The greatest war in the history of history and beyond has been waged against this very word. The Word. It’s been watered down, abused, adulterated, manipulated, and changed. With so much stacked against it and us, we have trouble believing it means today what it was meant to mean today. Many of us, either consciously or not, just have trouble believing that the shed blood of a Man named Jesus two thousand years ago has anything to do with us here today. As a result, we live in the crossfire and we’re not sure what to believe. But — what if? What if His story is true? What if this Jesus, the One who walked out of the tomb shining like the sun, holding the keys of death and hades, is alive — in you? In me? I write fiction for a living, and that’s either the craziest thing I’ve ever heard or it’s the most important word ever spoken. Let me give you an example: Jesus talked more about the Kingdom of Heaven than anything else. In Matthew 13, He compared it to a dragnet which was cast into the sea where it gathered some of every kind. When full, it was dragged to shore where the good was gathered into vessels but the bad was thrown away. Jesus was speaking of a future event in history which is really going to happen. Imagine being in the crowd when He said this — which incidentally, occurred just after He walked on water. If I found myself following a guy who could walk on water and yet talked about my cannibalizing Him and washing it down with a pint of His blood, I’d be scratching my head and reevaluating my decision-making paradigm. Even His disciples found it tough to believe, and they were standing in His presence! If Jesus is who He says He is, and He did what Scripture records Him as having done and is doing, then His life and His words, by their very nature, demand a response. And no response is still very much a response. We cannot look with cavalier indifference and/or resignation at the life and words of Jesus of Nazareth. You and I have a problem, and the appearance of a baby boy in a nameless stable in Bethlehem is our first clue that the problem is out of our control — that after a few thousand years of pleading with us to return to Him, He has come to us. 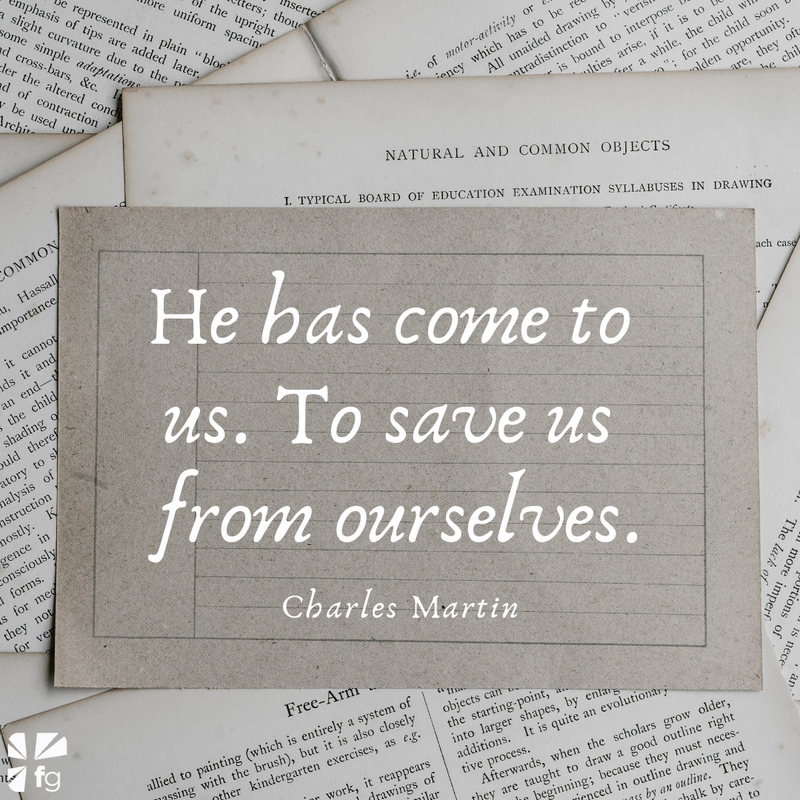 To save us from ourselves. The problem — the reason the King of kings stepped off His throne and came here — is my sin. Your sin. And our utter and complete inability to do anything about it. Our knowledge and understanding of this predicament have been watered down by time and a clever enemy, but in God’s economy, for reasons I don’t and can’t understand, sin requires a payment. Sin requires blood. I can’t explain why. It just is. Somewhere in here, I came to grips with the beautiful, tender, magnificent, barbaric, soul-shattering, eternal, unequivocal reality that the birth, life, and death of this innocent boy and magnificent Man are simply my King’s first step from throne to trough to cross to tomb to hell to God’s right hand. As a result, I am blood bought. Blood washed. And blood redeemed. And you are too. What kind of king does this? The weight of the answer pierces me because I know me. I am not worthy.